The 10TH Annual Kate Koogler Canine Cancer Ride is being held JUNE 15, 2013. Get friends, veterinarians, pet stores, family, coworkers and businesses to sponsor you and the proceeds go to fight bone cancer in dogs. We will meet at COZY RESTAURANT in Thurmont on Saturday June 15 at 10 AM. Motorcycles will leave at 11 AM and travel over the beautiful back roads of Frederick and Carroll counties to a delicious catered meal at MT TABOR PARK – home of the giant wooden sliding board – in ROCKY RIDGE, MD at the completion of the ride. Non riders can bring a carload and meet us at the park at 1:00. Participants pay a registration fee of $35.00 per person, kids 12 and under $15.00. Each person will receive a T-shirt, catered meal at the park, presentation about cancer research and a raffle ticket for a chance to win a weekend getaway. RAIN OR SHINE – In rainy weather we will still have the picnic under the pavilion. Participants are asked to obtain pledges and turn in donations at the park. Prizes will be awarded to three people with the most money raised in donations. Other great raffle prizes will also be available. 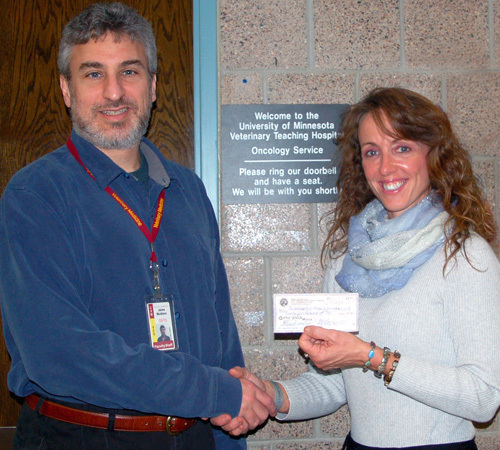 Dr. Teresa Lee Koogler, president of The Kate Koogler Canine Cancer Fund, Inc. presents Dr. Jaime Modiano researcher at University of Minnesota with a check for $25,000.00. This money represents the $9500.00 raised at this year's 9th annual motorcycle ride fundraiser and a portion of the $25,000.00 that The Kate Fund received as a grant from Petco Foundation. The money will be used to fund research into the causes and treatments of already existing naturally occurring bone related cancers in dogs. Bone cancer in dogs and people are identical so the research is directly applicable to human cancer research as well. The Kate Fund has donated more than $100,000.00 to cancer research since its inception in 2002 thanks to all our loyal sponsors and participants. The Kate Fund’s partnership with Petco Foundation will allow us to broaden our fundraising efforts for the future in addition to the 10th motorcycle ride in June 2013. Stay tuned for more information and check us out at www.katefund.org as details unfold. The Petco Foundation's mission is to raise the quality of life for pets and people who love and need them. The Petco Foundation is a 501(c)(3) non-profit corporation (#33-0845930) that supports other IRS (Internal Revenue Service) designated non-profit pet related groups as well as municipal/governmental agencies and educational institutions involved in animal causes. Save the date - 9th Annual Kate Ride is scheduled for Saturday June 16 - tentatively starting at Cozy Restaurant and confirmed end at Mt. Tabor Park - home of the giant wooden sliding board in Rocky Ridge. More details to follow - hope you can join us! On behalf of The Kate Koogler Canine Cancer Fund, I would like to thank everyone involved in the 8th Annual Kate Ride to raise money for bone cancer research in dogs. We had a beautiful day and an excellent ride for the 30 motorcycles who participated and the 77 people who turned out for the event. This year the Kate Fund raised $9,000.00 from the ride. The money will be split between The University of Minnesota and Colorado State University’s Animal Cancer Center where research is being done on naturally occurring cases of bone cancer that will not only help dogs but will help people with cancer as well. 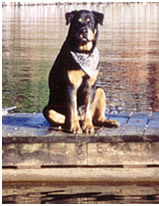 Kate Koogler Canine Cancer Fund  6053 White Flint Drive  Frederick, MD 21702  301-524-4411  Email us!